Hello from a new contributor! Hey everyone! Just wanted to pop in and introduce myself as a new contributor to this blog. Currently, I’m in my second year of residency and will therefore be subjecting you all to a whole lot of gen path! I’ll do my best to add interesting papers and odd tidbits that aren’t related to phase I, too. Hope to see you in the comments! I’m going to summarize the finer points of intrinsic and extrinsic apoptosis. As always, if you have comments, concerns, or corrections, please comment below! 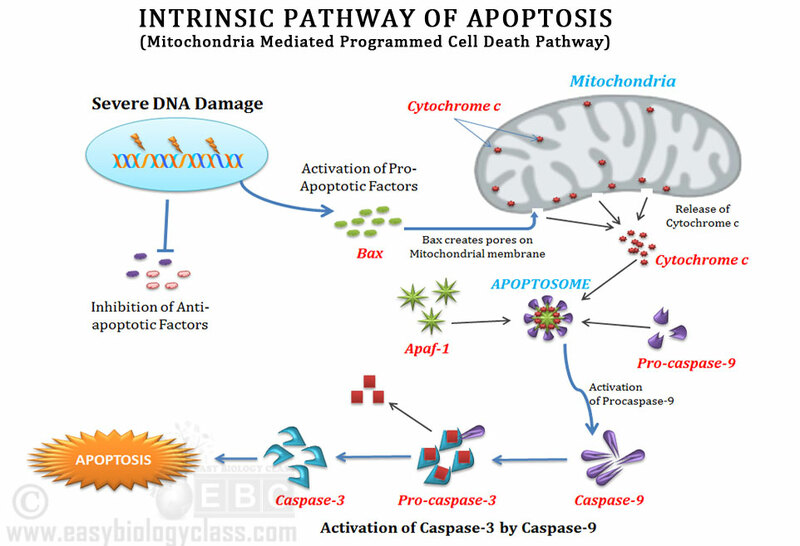 Intrinsic and extrinsic apoptosis differ in how they are initiated and how they go about activating executioner caspases (caspase 3 and 6 are the major players). Intrinsic is initiated by lots of things including ER stress, decreased growth factors, and genetic damage, among others. Meanwhile, extrinsic is initiated by binding of Fas-FasL forming a Fas associated death domain (FADD) on the cell undergoing apoptosis. Intrinsic apoptosis starts with some mechanism OTHER than Fas-FasL binding, things like DNA damage, ER stress, decreased growth factors, etc. Sensors of apoptosis, the BH3 proteins (Bim, Bid, PUMA, NOXA, etc) are upregulated telling the cell to undergo apoptosis. 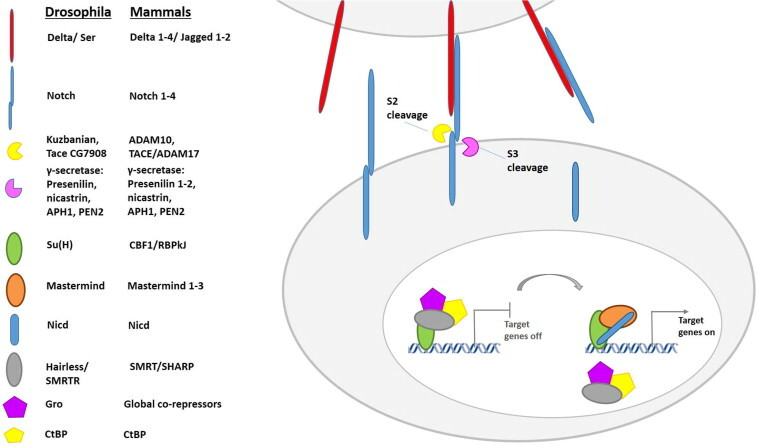 If the cell has undergone DNA damage, the BH3 protein PUMA (p53 upregulated modulator of apoptosis) may have increased expression levels due to increased p53 levels. Once the cell has committed (so to speak) to undergo intrinsic apoptosis, the mitochondrial membrane proteins that are anti-apoptotic are replaced with pro-apoptotic proteins (Bcl-2/Bcl-x/Mcl-1 –> Bax/Bak). The way I remember that is the proteins without an “a” are anti-apoptotic, the proteins with an “a” are pro-apoptotic. Bax and Bak allow the mitochondria to leak proteins, including cytochrome C. Cytochrome C binds to APAF-1 (apoptosis-activating factor-1) which also binds to caspase-9, forming the apoptosome. This activates caspase-9 allowing to activation of the executioner caspases and DNAse activity downstream. There are inhibitors of apoptosis (IAPs- including IAP, IAP1, cIAP2, XIAP, I’m sure there’s more) that are active within the cytosol. When Bak/Bax create pores in the mitochrondrial membrane, Smac/Diablo is released along with cytochrome C. Smac/Diablo function to block IAPs (inhibiting the inhibitors = pro-apoptotic). Extrinsic apoptosis is initiated by the binding of Fas (CD95) to FasL (but binding to TRAIL and the TNFα receptor TNFR1 can also induce the extrinsic pathway of apoptosis). When any of those receptors are activated they create a FADD (or TRADD)- Fas-associated death domain, where three receptors are brought close together. A FADD/TRADD will bring together pro-caspase 8 molecules close together, which is autocatalytic for cleavage into active caspase 8 (the way I remember that caspase 8 is with extrinsic apoptosis is that eight and extrinsic both start with “e”). Caspase 8 then activates executioner caspases 3 and 6 which leads to apoptosis. The protein FLIP (aka cFLIP, CFLAR) binds to, but does not activate, pro-caspase 8, making it an anti-apoptotic protein. There can be cross over between the two pathways. When Bid (BH3 protein) is activated, in Fas signaling induced apoptosis (extrinsic) it can activate the incorporation of Bax/Bak into the mitochondrial membrane and subsequent cytochrome c release (leading to intrinsic apoptosis). I know everyone’s institution does Gen Path prep differently. At ours, by the time you’re ready to prep for boards you have a summary of Robbins and Cotran and Zachary and McGavin (if you want our summaries, let me know in the comments). I was also gifted a really useful resource, that hopefully you’ve heard of- the Famke Aeffner and Cynthia de Vries 2013 compilation of R&C (8th ed) and McGavin (5th ed). Although it’s getting a little old, it’s largely still relevant (again, comment below if you’re interested in a copy). So I reorganized my textbook summaries to follow the Aeffner and de Vries summary and planned to start studying six months before the test (Mid-Sept). There are 8 sections in those notes, so three weeks a section is 24 weeks (of the 26). Plus starting one month before the test going through each section again in three days. That way I have about a week before the test to go through the things that are not making sense and read review articles. If you attend the gen path course by CL Davis they do provide a practice test (or two?) – not sure if they give everyone access to those. Let me know below if you have comments, suggestions, resources, or tips on getting through the next month before the big day! Yikes. Phase 1 is upon us. Less than a month to go, how are you all feeling for it? Personally, I’m not feeling great…but I do have a pretty detailed study plan (see upcoming post for a boards prep plan!) that’s helping to ease my worries. I’m going to be going through some of the important pathways and try to break them down into small nuggets of (hopefully) less painful gen path content. So the Notch gene is a highly conserved, it’s important not only during embryogenesis (developmental decisions including differentiation of tissue types) but in life after-birth too (regulating homeostasis, cancer development, immunity). Essentially, the Notch pathway has three over-arching functions (1) lateral inhibition, (2) lateral induction, and (3) lineage decisions. Lateral inhibition is when a bunch of multipotent cells that are adjacent develop a hierarchy of function so they do not all become the same cell type. On the other hand, lateral induction is when cells of one population determines the outcome of another cell population. Lastly, lineage decisions occur during asymmetric division. This allows daughter cells to develop into different populations of cells depending on Notch pathway modulators and expression. Although this pathway has many functions, there actually aren’t any second messengers and the mechanism is pretty straightforward (thank goodness). Essentially, a ligand binds to the Notch receptor (a heterodimeric, single-pass transmembrane protein) which releases cleaved Notch into the cytoplasm. The cleaved Notch is then translocated to the nucleus where it targets certain transcription genes (via interaction with CBF1/Suppressor of Hairless/Lag-1, depending on the species/scenario we’re talking about). This was a description of canonical Notch signaling, non-canonical exists too and has different ligands and end-points than canonical signaling. The cool thing about not having second messengers is that there is an important relationship between the amount of ligand that binds Notch and the response the cells undergoes. As far as test questions seem to go, most of the focus (at least on practice questions) seems to be on the role Notch plays in regulating angiogenesis. So we’ll dive into that. Both Notch (binding to the Dll4 ligand) and VEGF-A (binding to VEGF2 Receptor, mostly) are critical for angiogenesis and have opposing effects. Notch/Dll4 has inhibitory effects, limiting sprouting of vessels (even to the point of down regulating VEGF2R expression). VEGF expression actually induces Dll4 expression (negative feedback!) which helps to ensure that supporting cells and endothelial cells don’t occlude the new vessels being created. Typically, VEGF expression is higher in the leading cell than in the cells closer to the sprout (where it’s coming from the parent vessel). There are a lot more details in Zachary and McGavin on the nitty gritty of angiogenesis (EPCs, BMP, PDGF, oh my! ), but the information above is the basics on Notch/Dll4 involvement in the process. Questions, comments, and corrections are welcome in the comments! HISTORY: 10 year old female spayed Japanese Chin developed a mass on the right zygomatic arch. Radiographs showed regions of bone lysis and proliferation and invasion of the right temporalis muscle. The zygomatic bone is effaced by an expansile locally infiltrative, poorly cellular neoplasm of mesenchymal cells arranged in small whorls and streams in an abundant sclerotic collagenous stroma with ossification of the stroma and remodeling forming marrow spaces in the central regions. Neoplastic cells have indistinct cell borders, scant cytoplasm, and are fusiform. Nuclei are flattened, ovoid, and often hyperchromatic, with some at the periphery having finely stippled chromatin. At the leading edge of the tumor the reactive bone forms a shell around the tumor, and is being lysed as the tumor expands and infiltrates. In some areas the neoplasm infiltrates and expands the surrounding skeletal muscle, and forms small whorls which advance out from the main mass. Low power view of zygomatic arch tumor, showing some connection to the bone in the lower left corner, and the extension into the muscle into the upper left corner. The mass is haphazardly ossified, and interspersed with dense hypocellular fibrous tissue. High power magnification at one edge of the tumor where it was less ossified, showing a hypocellular whorling mass of fibrous tissue eroding the surrounding reactive bone to the right of the image. This shell of reactive bone is indicative of a moderately growing mass. Slower growing tumors may have lamellar bone at the periphery while more rapidly growing tumors efface any reactive bone. Moderate magnification of the center of the mass, in a region where the fibrous tumor is effacing islands of reactive woven bone. 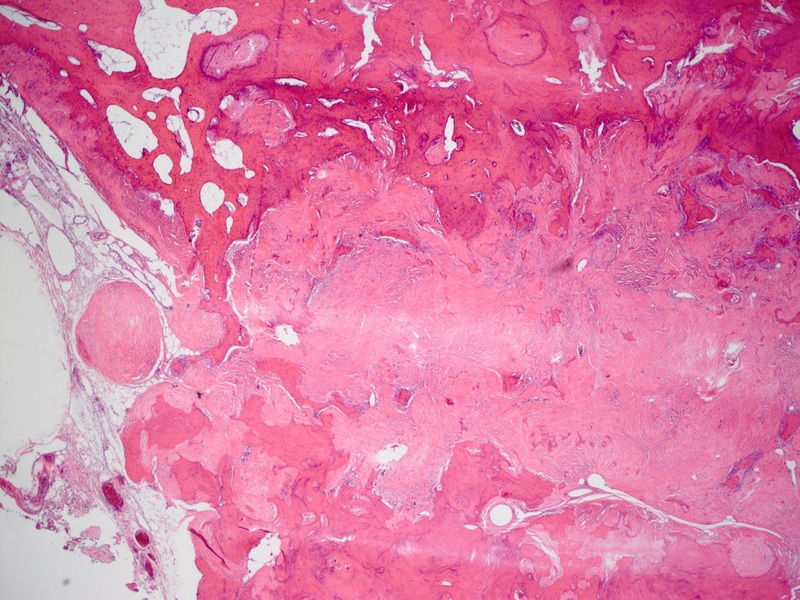 The woven bone is bordered by flattened to plump osteoblasts and loose connective tissue, but in some areas the fibroblastic tumor erodes them. In the center there is a whorl of fibrous tumor with a small area of mineralization. This is deceptive, as it can be interpreted as bone produced by the tumor. But in this case, this is simply mineralization of a dense collagenous stroma, which can occur in the right microenvironment. High magnification view of a region of mineralizing tumor stroma. 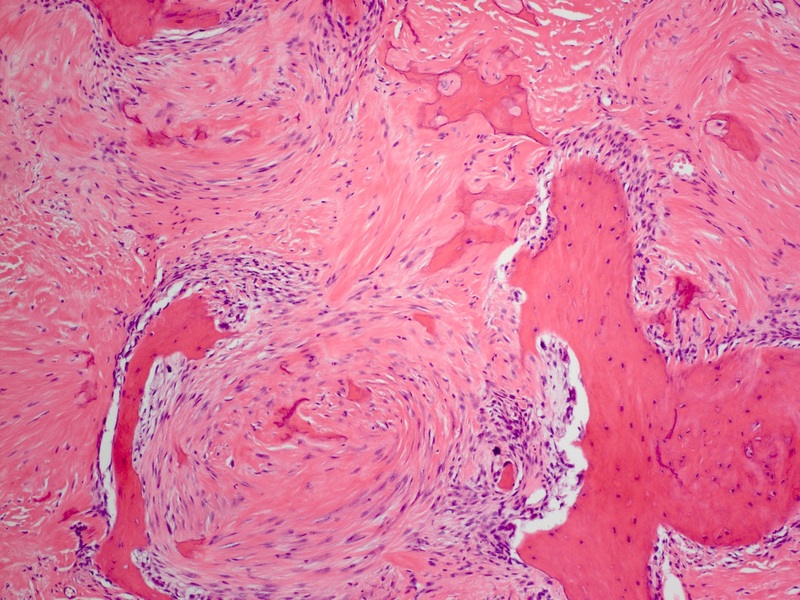 Notice the blending of collagen fibers of the tumor with the surrounding bone, and in the center the slight stippling of basophilic stroma indicating small areas of mineral deposition that are independent of osteoblasts. This is an uncommon tumor which most likely arose from either the periosteum or medullary cavity of the zygomatic bone. Differentials included were benign fibro-osseous tumors such as ossifying fibroma, or fibrous dysplasia, however the bone produced seemed to be eroded by the tumor stroma as it advanced, and did not seem to be produced by it. The central regions of osseous metaplasia were formed by calcification of the haphazard collagenous fibers produced by the tumor, which can be seen using polarized light microscopy. As the tumor matrix mineralized it then became fair game for the resident osteoclasts and osteoblasts to begin laying down reactive woven osteoid thereby forming the ossified portions of the tumor. The remodeling that has occurred is a factor of the prolonged time course and slow growth rate of this tumor. A google search for the term sclerosing fibrosarcoma will find a medical diagnosis of “sclerosing epithelioid fibrosarcoma”, which has a particular histological appearance that this tumor did not share. The term “sclerosing fibrosarcoma” is more a descriptive term, and one given to me Dr Roy Pool from Texas A&M when I consulted him on this tumor. Perhaps this may become a distinctive entity in veterinary medicine as more cases are described and recognized. The biological behavior appears to be less aggressive than other fibrosarcomas of bone, and should be differentiated from the highly aggressive entity of the “histologically low-grade, biologically high-grade fibrosarcoma” of the mandible and maxilla. The closest human analog to this tumor is the desmoplastic fibroma, but again the histological appearance is distinctive. 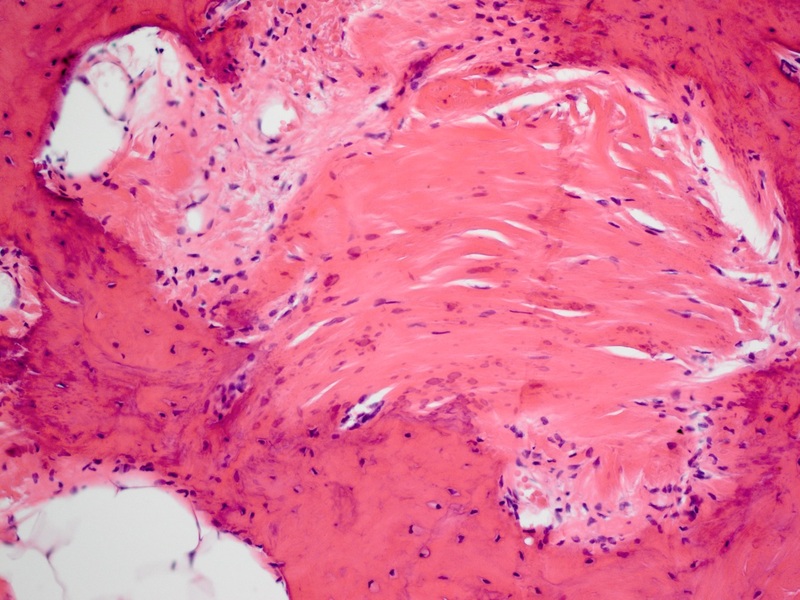 The word “desmoplastic” refers to the abundnat collagen fiber content in this tumor which resembles connective tissues and shows no mineralization (desmos: A bond, fastening or chain; ie desmitis -inflammation of a tendon). The tumor in this bone does not share this type of collagenous fiber arrangement. Initially, prior to histopathology, I was expecting a multilobular tumor of bone (MLTB; Multilobular osteochondrosarcoma) given the location. These tumors appear to be associated with bone symphyses and suture lines (skull, hard palate, maxilla, mandible, zygomatic bone). The microscopic architecture is usually characteristic, however it is said that as these become high grade this architecture is lost. Differentiating a high grade MLTB from an osteo- or chondrosarcoma can be difficult, but in my experience there are regions of spindle cell sarcomatous sheets and bundles that are not seen in chondrosarcoma, and there is no convincing bone produced. This probably reflects the fibro-osseous origin of the tumor. Nevertheless the tumor in this case is very low grade, and had no features in common with a MLTB. If anyone has seen a similar tumor in the skull or long bones I would appreciate hearing about it. 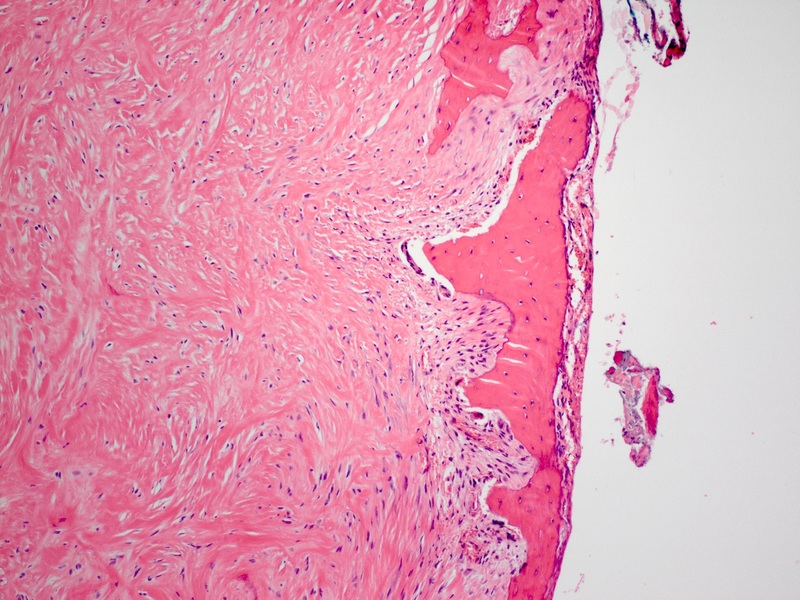 Desmoplastic fibroma of bone: A report of 8 cases and review of the literature. J Bone Joint Surg Am. 1985 Jun;67(5):732-47.